Large working ranges with the tolerances and precision of much smaller systems? It’s possible with the TLV Series of 3-axis, two-dimensional CO2 laser cutting systems from NTC America—Laser Group ( Novi, MI). The five models of TLV lasers incorporate hybrid technology, allowing both the machine and material to move at the same time during the cut, providing a more stable machine operating platform and more accurate cuts, independent of the system’s size or the workpiece’s bulk. Plus, with five laser power options starting at 2.5kW and working up to 6.0kW, these laser cutting systems deliver deep penetrating cuts to 1″ thick. And, the TLV bridge-style machines incorporate a wide open design that offers access from three sides to facilitate material loading, though its compact configuration typically requires less floor space than similar capacity machines. Among the five sizes of TLV units are processing centers that begin with 51″ x 49″ (1,300mm x 1,250mm) and range up to a 246″ x 86″ (6,250mm x 2,200mm) X-Y work envelope…with 12″ (300mm) Z-axis vertical stroke. The TLV systems feature drives consisting of AC servo motors, plus the hybrid construction that requires ball screw and linear ball guide mechanisms that, as opposed to conventional rack and pinion mechanisms on the non-hybrid type machines, are better suited for accuracy and stability. The TLV’s five power options encompass a full range that includes 2.5, 3.0, 4.0, 5.0 and 6.0kW, to match application requirements. The systems use dependable fast axial flow, DC excitation lasers for consistent and targeted power output to assure full penetration and clean cutting action. The TLV systems offer a high level of cutting productivity with a rapid feed rate of up to 1,181″ (30,000mm) per minute in both the X and Y axes, and up to 787″ (20,000mm) for the Z-axis. That Series also features feed rates of up to 787″ (20,000mm) per minute. Yet, given those sizes, power options and speeds and feeds, these lasers produce precision with positioning accuracy as close as +0.0005″ per 12″ (+0.01mm per 300mm). The performance specifications of the TLV Series are further expanded with an array of features and options that introduce flexibility, ease of operation and automation into the mix. The series offers a fast-response gap sensor to monitor optics-to-material distance for optimimum cutting performance. The auto-focus option allows focal point adjustments to be made on-th-fly during cutting to further enhance the cut quality on thicker or irregular materials. To maximize loading and unloading efficiency, the TLV units provide automatic stock clamping and work lift mechanism as standard accessories; and for its large material handling capacity, a wider scrap-handling conveyor design that eliminates jamming and downtime. Plus, a centralized lubrication system helps lower maintenance requirements while a telescoping cover protects X-axis motion guides from contaminates. The laser cutting systems incorporate a Fanuc controller and NTC-developed laser cutting software that synchronize machine motion with beam delivery to optimize performance, resulting in smooth cutting action and sharp, clean edges for complex and simple part shapes alike. The interactive software features subroutines, calculations, functions and a cutting parameters library that simplifies circle, arc and linear interpolation, mirror imaging, scaling, automatic skew compensation, and part program storage/recall for fast setups. A comprehensive diagnostics monitoring system lessens troubleshooting procedures to minimize downtime. A broad range of options and auxiliary equipment from NTC America expand the versatility, productivity and operating economies of the TLV laser series. Depending upon application requirements, various system and cell automation combinations are available; including multiple level stock shelves, part offloading and storage, automatic focus and gas assist control, and material staging pre-load tables. With the sophisticated level of CNC control and software, dependable laser performance, rugged construction, and precision, even to the assurance of a non-jamming conveyor, these automation features allow the TLV’s to operate with minimal attention or totally unattended for extended periods. In addition to the TLV Series of laser cutting systems, NTC America’s lineup of laser products includes the TLZ Series 2-dimensional, 3-axis systems with flying optics, the TLX Series 3-axis gantry-design machines for large (up to 15′ x 100′) workpieces, and the TLM Series high power CO2 machines with bridge-type construction and 5-axis control for precision cutting and welding of 3-dimensional workpieces. 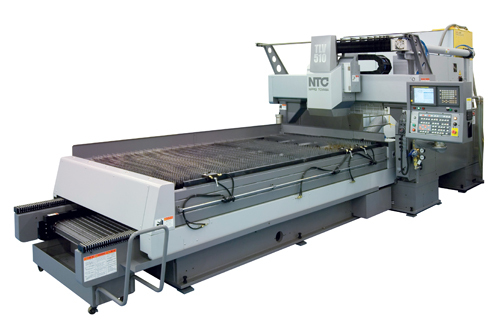 The TLV Series of 3-axis CO2 laser cutting sytems from NTC America feature hybrid construction to provide simultaneous movement of machine and material and a stable, precise cutting platform, along with five working sizes to 246″ x 86″ and six power options to 6.0kW for a versatile range of applications.